While I was in Chennai, the Mylapore Festival was taking place. This is an annual festival of cultural events which is held in the historic neighbourhood of Mylapore. 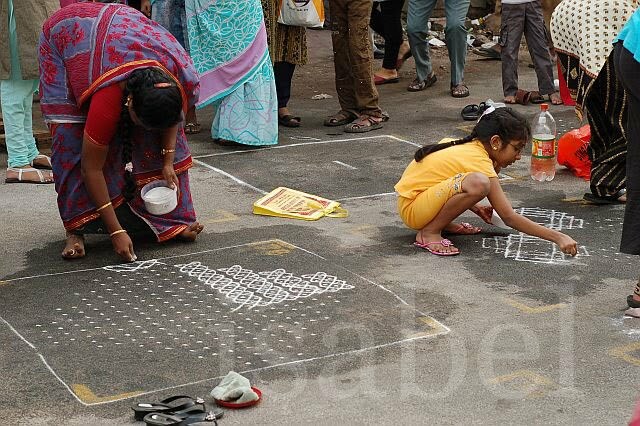 One of the events was a Kolam Contest. I knew this would be a great photo opportunity so I took my camera and headed to North Mada Street near the Kapaleeshwarar temple on Sunday afternoon. When I arrived, there was a long line of woman waiting to register their names for the contest. A section of the street was closed to traffic. 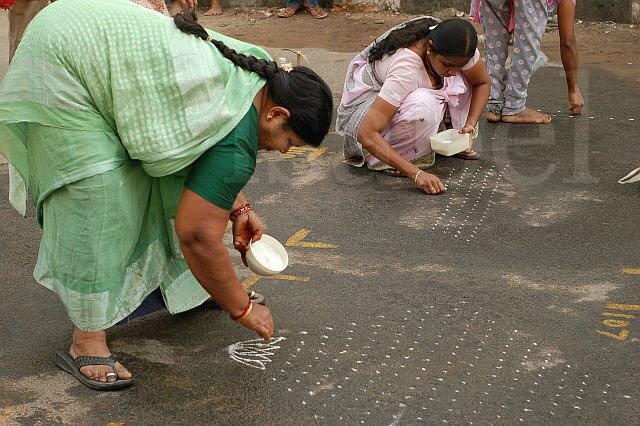 Each woman was allocated a space on the road about a square metre in size which was marked with a number. Each space was carefully swept of debris and then sprinkled with water so that the rice powder used to draw the designs would ‘stick’ better. First neat rows of evenly spaced dots were applied. 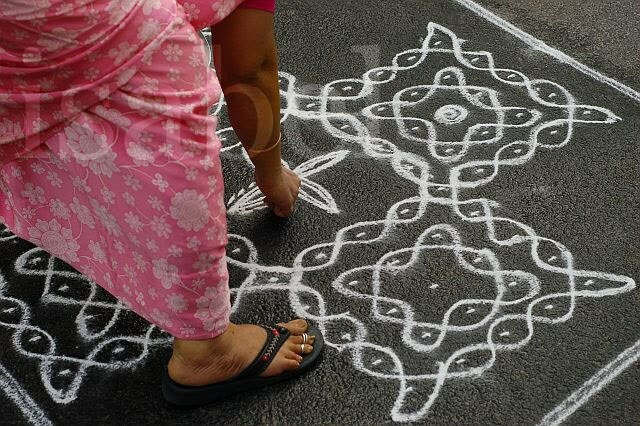 These carefully calculated ‘dots’ ensure a geometrical symmetry to the kolam designs. Quickly the rows of dots are then transformed into intricate and beautiful patterns made of elegant loops and swirls. Each allocated square became an elaborate, beautiful design. Some featured flowers, peacocks, birds. 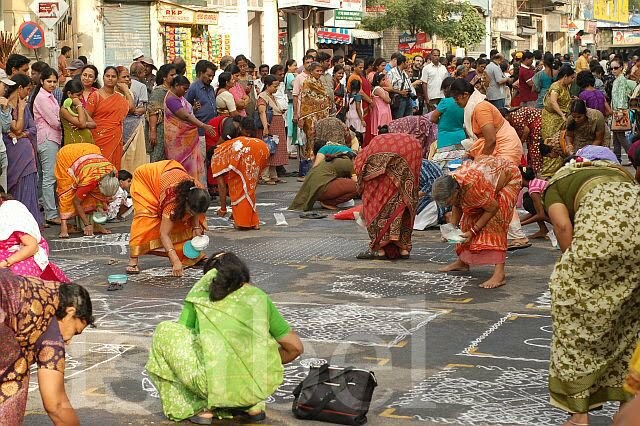 By now a crowd had gathered around the sidelines watching the road being transformed into a tapestry of decorative designs. 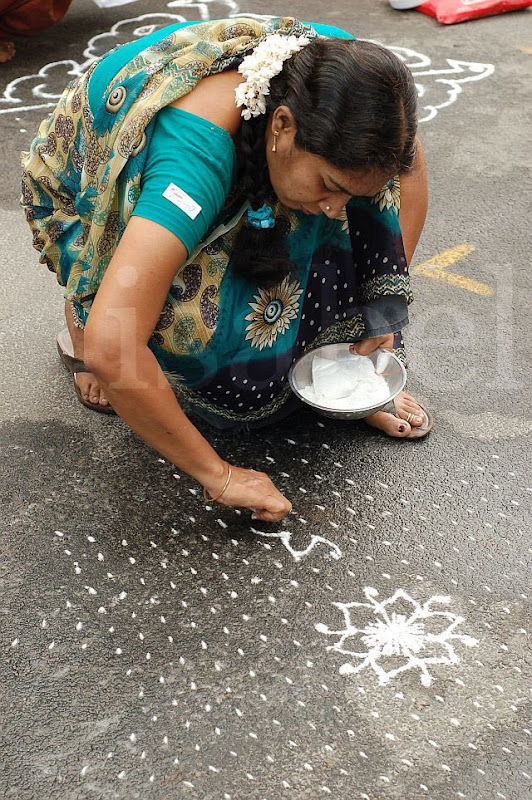 Drawing a kolam – also called rangoli (kolam is the Tamil word) – every morning in front of the household's doorstep is a tradition which persists in South India and is an example of how art is part of everyday life. 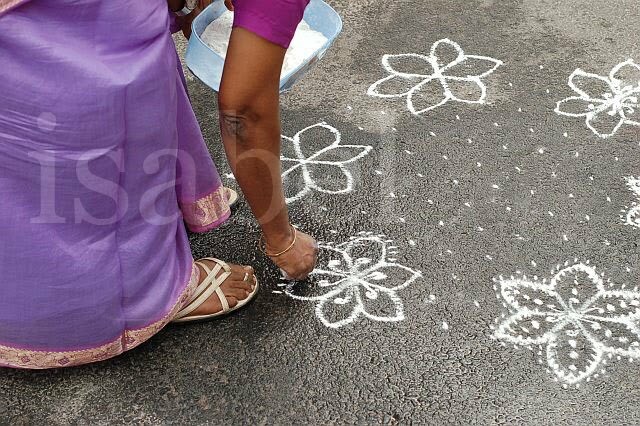 A kolam is like a ‘welcome mat’ welcoming you to the family home. It also has a spiritual significance: it helps gods find the way inside, bringing prosperity and good fortune to the household. I don't know who the winners of the contest were, but I'm sure the judges had a hard time deciding! 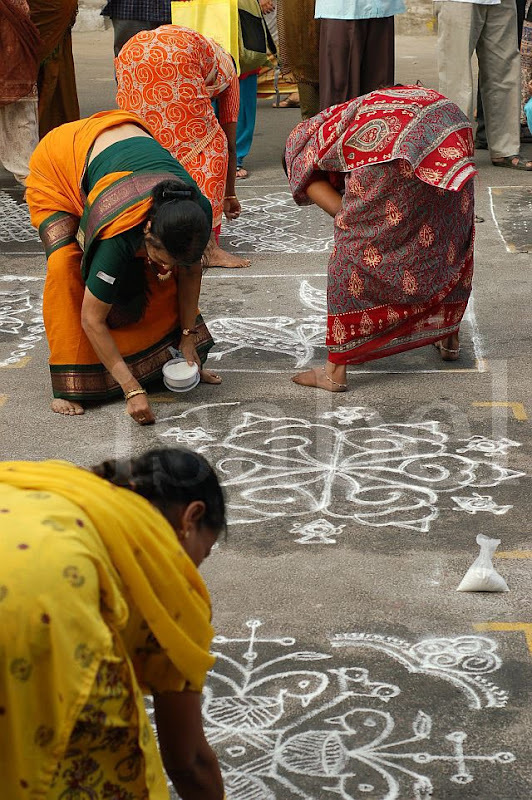 These kolams are so beautiful--thanks for sharing your terrific photos! I love how these women are artists of a kind--creating beauty in their everyday lives--even though they themselves would probably deny it. 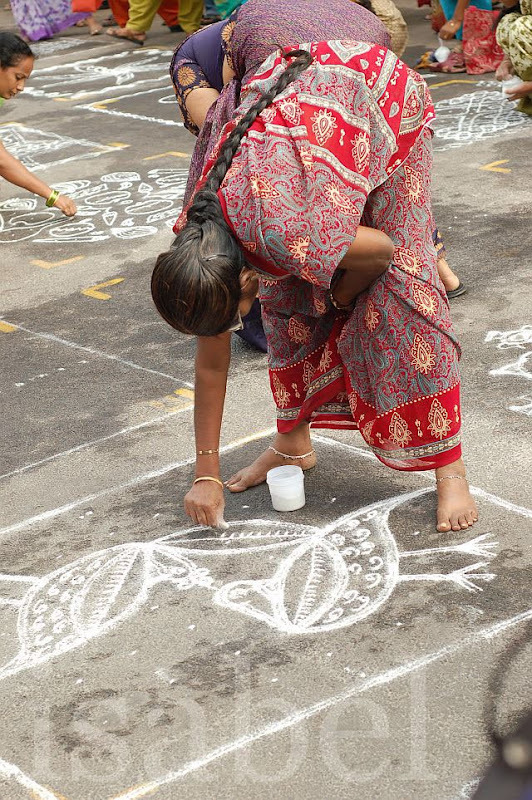 I am so glad you made it to the kolam contest! I wanted to go but couldn't. Now, thanks to you, I can experience it! Gorgeous! I am so fascinated by the rangolis/kolams that I see in my neighborhood! I didn't know that key to their uniform appearance is the dots. As always, thanks for sharing! I love the designs - these folks have some great talent! The artists are coming out!!! 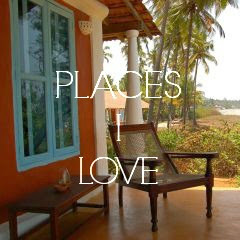 I loved seeing India from your eyes. It's very beautiful and I especially like the sidewalk chalk drawings. 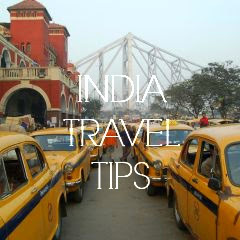 I just found out about your blog by doing some research while writing artikles about India - and I am very happy about it! 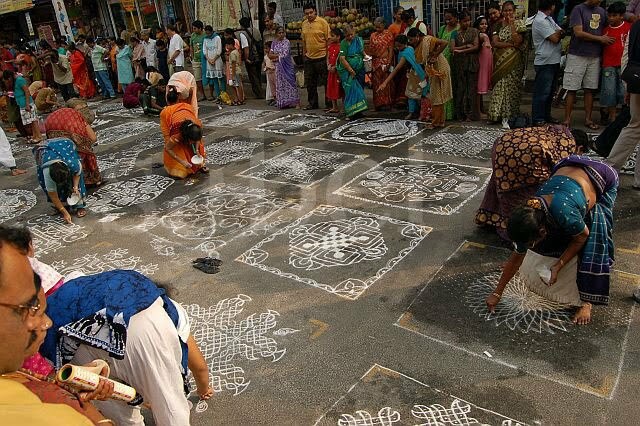 I use to create very simple kolams here in Berlin, Germany after having spent some time in Tamil Nadu. I love your fotos from the kontest, I hope I will be there next January. Thank you for sharing your experience and your love for India. 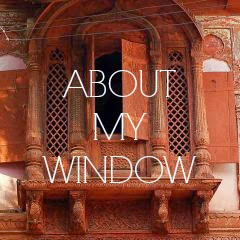 Is there any possibility to know more about you as the author of the blog? I couldn't find out.